Delfi‑n3Xt is the successor of Delfi‑C3. It is a triple-unit CubeSat demonstrating a micro-propulsion system, amorphous hydrogenated Silicon solar cells, a new radio platform, an agile electrical power subsystem and an active attitude control subsystem. The Delfi‑n3Xt project initiated in 2007 and the satellites was launched on the 21st of November 2013 from Russia. The satellite operated successfully for three months, fulfilling its main mission objectives and achieving mission success! Unfortunately, contact with the satellite was lost after an experiment with the linear transponder. This page provides an overview of the technical highlights of Delfi‑n3Xt. Each picture links to the most relevant scientific paper available on that topic. Delfi-n3Xt is a 3U CubeSat and is the second satellite of TU Delft. It has a mass of 2.8 kg and 5 Watt of orbit average power. It achieved its primary mission objectives after 3 months in-orbit. An experiment with 14 small amorphous Silicon solar cells is conducted to validate laboratory research. Together with SystematIC BV, an agile electrical power subsystem has been developed to generate continuous power based on a cellular architecture. Together with ISIS BV, the radio systems have been developed using downlink at VHF and uplink in UHF as well as an experimental high data rate downlink in the S-band. A technology demonstration payload from TNO and partners. The system is based on cold gas generators, which are non-pressurized upon launch. A triple-axis attitude determination and control subsystem is demonstrated, including custom made reaction wheels, sun sensors and magnetorquers. With a redundant onboard computer, lean electrical interfaces and local protection circuits, an attempt is made to increase the reliability and data integrity onboard. A custom made structure based on two L-profiles and comprising VDA and Kapton tapes, provide both fast integration as well as passive thermal control. has developed the micro-propulsion demonstration payload. has developed the redundant radio transceivers, of which one acting as demonstration payload. has developed the Electrical Power Subsystem main unit and provided general support on electronics. has developed and produced part of the subsystem electronics. 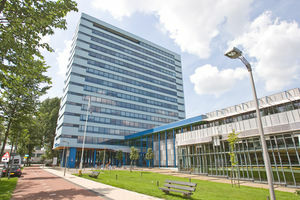 Defence and Space Netherlands, formerly known as Dutch Space, contributed to solar panel integration and provided several in-kind contributions and expert support. a former subsidy program within the Netherlands for innovation in micro-electronics technology, has contributed to Delfi‑n3xt with a financial grants for the research and development. hosted and sponsored the vibration test. has sponsored with software licences for the ESATAN Thermal Modelling Suite. has sponsored Delfi‑n3Xt with Datamate connectors which are used for the electrical interfaces.